Just outside Hanoi, Vietnam, actually 60 km outside Hanoi, the Perfume Pagoda (Huong Pagoda) is a complex of Buddhist temples, shrines, and shops built into the Huong Tich Mountain (Mountain of the Fragrant Traces). 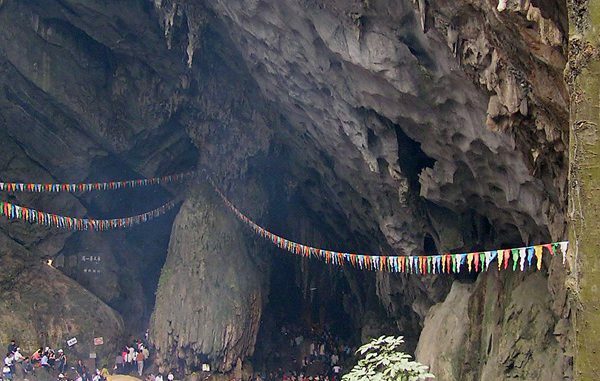 The largest of the many temples is located in the mouth of a cave and is known around the world as the Perfume Temple, though locally is is called the Inner Temple (Chua Trong). There are several Pagodas that make up Chua Huong, and they are spread amongst the limestone hills and tropical forests of Huong Mountain. The center of the Pagoda complex houses the Huong Tich Cave. In the mouth of the cave sits the Inner Temple (Chua Trong). It is believed that the first temple to sit on the site was a small structure that is the current site of Thien Tru, which existed in the 15th century. Legend says that the site is over 2,000 years old and was discovered by a meditating monk, who named it after a site in the Tinetan mountains where Buddha practiced asceticism. The stone steps leading to, and the Kim Dung shrine itself date from 1686. There are many small statues inside and around the cave, but the largest and grandest are those of Buddha and Quan Am. Both of these are made of green stone and Quan Am’s left leg is stretched out with her leg resting on a lotus flower. The original versions of the two large statues were made of cast bronze but the current ones have been in the cave since 1793. Take comfortable shoes and make sure you have an entire day to dedicate to spending at the Pagoda complex. There are plenty of kitschy knick-knacks to buy along the way to and from the large cave Pagoda that is the highlight of the trip, but they are for the most part used as offerings. Take lots of small bills as they are literally thrown into the water and dropped in large urns as offerings. Small bills are also going to be needed to pay for the water taxis and to leave tips for people along the way. If you do not like big crowds this will be an uncomfortable day but will likewise be well worth the time. Take the ride up and the walk down if you want to save a little time but still want to take in all the glory that is the Perfume Pagoda. It’s a little easier on your feet and you will still get to see all the fun stuff for sale along the way. The Perfume Pagoda is always filled with tourists and pilgrims but the main season for pilgrimage is during the Huong Pagoda Festival when thousands travel to the temples from all over Vietnam. 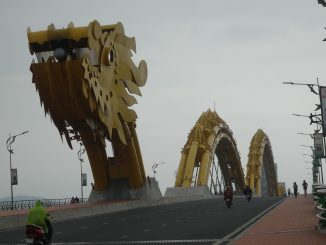 Most of the tourists will be there from mid-January to mid-March. The festival based around the lunar calendar officially begins in mid-February and is seen as good time for young adults to find romance and begin their courtships. During the festival there are many local shops that collect or butcher local animals and they can be purchased along the way to and from the mouth of the cave. If you have spent any time in Vietnam you will not have much difficulty booking a trip to Hanoi, and from there just about any hotel will be able to get you to the Perfume Pagoda. There are many small travel agents that will try get your business and for the most part they are going to be great. I like the comfort of booking from the hotel because I can stay in my room and sleep till it’s time to get up to meet the shuttle to the boat.